I adore these zucchini sticks, but the recipe is involved and therefore I only make them about once a summer. The breading is flavorful and the dip is mild yet sweet and delicious. The dip really is the key, so don't skip it. I imagine it would be good for dipping other things--perhaps sweet potato fries or raw veggies. The sticks are best fresh, because they get soggy in the fridge. The original recipe called for 3 medium zucchini and I ended up with a pan and a half of sticks, so I recommend a smaller amount of squash. Melt the butter in a medium skillet over moderate heat, and add the sliced onions. Cook, stirring occasionally, until the onions soften, then caramelize. This takes 15-30 minutes, depending on how caramelized you like your onions! I like them quite brown in color, which is closer to the 30-minute mark. The lower the heat, the longer it takes, but the less likely you are to burn the onions. Once onions are caramelized, remove from the heat and add the vinegar. Place mixture into a small food processor or blender. Add the honey and mustard, and process or blend until smooth. Add the mayonnaise and salt and pepper to taste, stirring to combine. Refrigerate, covered, until ready to serve. Place the zucchini sticks in a colander over a bowl and sprinkle with the tablespoon of salt. Let the zucchini drain for 1 hour or longer; rinse and pat dry. Combine the Panko, Parmesan, and Italian seasoning and set aside. Preheat oven to 425. Dredge zucchini sticks a few at a time in the egg, then roll in the crumb mixture. Place the sticks on a greased baking sheet. Bake for 12 minutes, turn over, and bake for an additional 8 minutes, until golden brown and crisp. Serve immediately, with sweet onion dip. Biscuit shortcakes are the way to go for someone, like me, who doesn't like sugar overload. The focus becomes the fruit and, as you can see by the photo, the cream. I've posted strawberry shortcakes and this recipe is similar except for the addition of candied ginger which is worth seeking out or making it yourself. Peaches and ginger seem made for each other. Stir the dry ingredients together in a bowl. Grate the frozen butter through large holes of a cheese grater over the dry ingredients. Using your fingers, break up the butter in the flour mixture until it is the size of small peas. Stir in the candied ginger. Mix the egg, vanilla and buttermilk. Add to the dry ingredients and stir just to moisten. If it seems too dry, add 1 T more buttermilk. The texture will be shaggy and barely moist. Turn the dough out onto a floured counter or pastry cloth. Knead with a light touch a few times, then roll or pat the dough into a rectangle about 3/4 inch thick. Cut 6 biscuits with a 2 1/2-inch biscuit cutter and gather scraps to form another. (You can also use a glass to cut the biscuits.) Place on an oiled baking sheet and baste with the egg white and sprinkle with 1/2-1 teas (or so) sugar. Bake until golden, 12-15 minutes. Let cool. Mix and set aside while peaches release their juices. Mix ingredients in a small bowl (chill together in freezer for 5 minutes with the beaters if your kitchen is hot). Bring beaters to high speed and whip until cream holds peaks. Halve the biscuits. Spoon the fruit and its juices over the bottom half. Add a dollop of the cream and cover with the biscuit top. There are only two of us in this household, so I usually freeze the extra biscuits but for no longer than a month or two. If you aren't using all your biscuits, macerate one peach per serving and divide the whipping cream recipe accordingly. Let me strongly encourage you to use real whipping cream. High altitudes (up to 5,000 feet) don't seem to make much difference with these biscuits. Tom made these one summer for the entire family, while we were at my grandfather's cabin in Pine Valley. Pine Valley is a place of refuge for us, a quiet valley with many family memories. The tacos are even tastier for this pleasant association. Calabacitas is a Mexican vegetable dish with squash, corn, chile, and often tomatoes. A Google search reveals a number of variations. Corn sweetens the squash, and chile can give it a kick. On that note: I have bought what I thought were poblanos from at least two grocery stores. They have been labeled pasilla. They have no heat whatsoever, so I'm not sure what I'm really using. These tacos are delicious without the heat, though. Toss zucchini with salt in colander and let sit for 30 minutes. Rinse zucchini then dry on paper towels. Roast the poblano under the broiler, turning occasionally, until the skin is entirely blackened. Depending on the distance of the chile from the broiler, this can take 20 minutes or so. Cool briefly, then peel the chile, remove the seeds, and slice into thin strips. Heat butter and oil over medium-high heat in a skillet large enough to hold zucchini in single layer. When hot, add zucchini and fry for 8-10 minutes, stirring frequently until zucchini is browned and tender. Remove zucchini, draining as much butter and oil back into the pan as possible. Reduce heat to medium. Add corn, chile, and onion to skillet. Stir regularly until onion is lightly browned, 8-10 minutes. Stir in cream, zucchini, and chicken. Simmer for a few minutes until the cream is a thick glaze. Serve on warmed corn tortillas. When I first tasted my grandpa's zucchini casserole, I fell in love. When we planted zucchini in our garden and started getting more zucchini than we could eat I wanted to make it. I asked my grandpa for the recipe but he didn't have it written down. The next time I visited watched him make it. I had written everything down but I lost the paper so I redid it by remembering what I had seen and consulting my grandpa. This is my end product. It is pretty simple to make and pretty tasty too. While onions and zucchini are boiling, make the bread crumbs. Melt 2 T butter in a skillet, and then add the crouton-sized pieces of bread. Cook until golden brown. When the zucchini and onions are done, drain and put mixture into bread loaf pan. Cut the remaining butter into tablespoon cubes and add salt, cheese, eggs, and butter to mixture and stir until everything is mixed. Then pour mixture into bread loaf pan and top with bread crumbs. Put in oven *(see notes) at 400 for 20 to 30 minutes. Eggs should be cooked and hard. * Don't boil the onions and zucchini for too long though. You want them soft but not too soft. * Instead of putting the casserole in the oven my grandpa would microwave it for 15 minutes. For some reason I really wanted some soft pretzels tonight. I had no idea how hard it would be, if the boys would like them, or what to serve them with. I searched for pretzels and found this recipe: http://www.foodnetwork.com/recipes/alton-brown/homemade-soft-pretzels-recipe/index.html. So Betsy and I set out to do it and they turned out great. I didn't know what else to do with the pretzels so I just sauteed some zucchini and tomatoes in olive oil and sauteed some leftover elk roast with some onions. Yet another recipe from Jack Bishop's Vegetables Everyday, a cookbook that would be in my top five favorites list. I sincerely wish I'd had this book years before it was published when I was attempting to get my kids to eat vegetables. I hope that those of you who don't have fresh tarragon on hand will realize that the herb is optional. It is great in this dish, but green beans and walnuts are wonderful even without adornment. The same is true for walnut oil, although it does make a difference in the flavor. It can be hard to track down and is expensive so opt for olive oil rather than skipping the recipe all together. Bring to boil 2 1/2 quarts of water to boil in a large saucepan. Add the green beans and 1 teas salt to the boiling water. Cook until the beans are tender. Drain the beans well and stir in the walnuts and tarragon. Drizzle the oil over the beans and toss gently to coat them evening. Season with salt and pepper and serve immediately. I adore this salad and must include it because each year I have to wait 8 months before I eat it in celebration of the arrival of "good" tomatoes. Caprese and BLT's are the best things about summer. In 2006, Leon moved ahead to New Mexico while I stayed alone in Virginia to prepare the house for selling. We had a large group of healthy tomato plants. For two months, at least, I ate Caprese Salad, BLT or Greek Salad in rotation. Not once was I bored. A web search for this salad will bring up beautiful variations on serving, but what is necessary are vine ripened tomatoes and fresh basil. Here in USA, especially in rural towns, it isn't easy to find really good mozzarella but, in this case. the cheese is a foil for the flavors of tomato and basil. This is a throw together recipe there are really no measurements. Of course, this salad can be made for any number of diners. Place halved cherry tomatoes into a bowl. Drizzle with olive oil and generously sprinkle with salt and freshly ground black pepper. If necessary add a little more oil. Let sit for 10 minutes while juices accumulate in the bowl. Stir in lemon juice and then stir in the cheese; let rest for 5 minutes. Stir in the basil leaves. When I make this with tomato slices, I place them on a plate and drizzle with oil and top with salt and pepper. Letting it rest while the tomatoes release some liquid yields what I consider the best part of the salad--the salty, oily, juice. I don't let this go to waste (the juices are sopped up with bread after serving or somebody licks the plate). I place slices of cheese on top of the tomatoes and then basil leaves. You can drizzle more oil on the cheese or the basil. Be generous with your seasonings and with the basil. Eat as much of this salad as you can because November is just around the corner! Since we seem to be focusing on what our gardens are producing at the moment, here is a recipe that will use up some of my summer berries. We grow everbearing, or day neutral, strawberries and raspberries and both are bearing now. This is a sweet coulis which can be drizzled on yogurt, ice cream, cakes, waffles, fruits, cheesecake, pies, and other desserts. The liquid in this sauce comes only from the fruits themselves (and a little lemon juice) which keeps the sauce fully flavored and quite thick. Place all ingredients but lemon juice into a saucepan over medium heat. Bring to a slight simmer, stirring occasionally until sugar is dissolved and berries are heated through. Cool for 5 minutes and place in a blender or food processor. Blend until pureed. Add lemon juice and pulse once more to incorporate juice into the sauce. Taste and add a bit of sugar, if needed. Strain mixture through a fine mesh strainer into a small bowl stirring and pressing on pulp to extract as much liquid as possible. Cover and place in the refrigerator for at least 1 hour. Stir just before serving. The puree may thicken while cooling; if it becomes too thick add one or two teaspoons water. The coulis may be refrigerated for 4-5 days and frozen for 4 months. It is a lovely thing to find some coulis in your freezer in the dark months of winter. This recipe was a revelation. I love waffles for breakfast but rarely take the time to make them. So when I have zucchini on my hands, I make triple batches of these waffles and freeze them. Then it's just a couple minutes in the toaster or waffle iron and I have a hot breakfast ready to go. Salting the zucchini removes some of its moisture. I tried these once without salting--and the waffles were quite soggy. Also, the original recipe just said 2 medium zucchini, which can result in a large variation in the actual amount of the vegetable depending on your definition of medium. I have found it works best with 2 smallish zucchini, for a total of 1 lb. In the future I may try more zucchini and less milk. I'll report any significant discoveries. Grate the zucchini on the large holes of a box grater or using a food processor. Place in a colander and sprinkle with a teaspoon of kosher salt. Place the colander over a bowl, and let the zucchini drain for 30 minutes. Rinse under cold water, shake off excess liquid, and squeeze the zucchini between several layers of paper towels or a clean dish towel. In a large mixing bowl, stir together the flour, baking powder, 1 teas salt, cinnamon, and sugar. In another large bowl, whisk together the milk, eggs, and vanilla. Add the dry ingredients and beat until smooth. Stir in the zucchini and mix well. Cook according to your waffle maker's instructions, until waffles reach desired crispness. Until I moved to New Mexico I ate beans that were either reconstituted dry beans or canned. I suppose when very young I had a few lima beans in a frozen mixed vegetable mix. I started growing black-eyed peas amongst my corn (for nitrogen) and began to understand how lovely a fresh shell bean can taste before it is allowed to dry completely. I've also grown Hopi beans, a much larger bean which dries beautifully but tastes wonderful fresh. 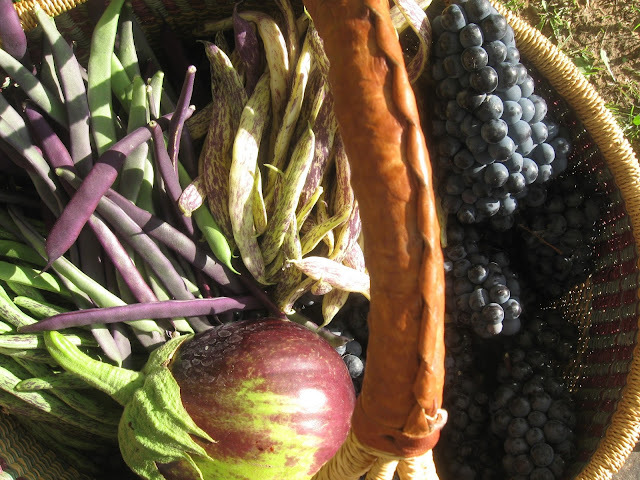 If you have no source for fresh shell beans, you can find frozen black-eyed peas or limas in the supermarket. See note below for suggestions if you can't find frozen shell beans. Although I trust the author of the recipe, I was surprised at how delicious this soup is. It is completely satisfying as a meatless meal and filling as well. I like to serve it with crusty bread or cornbread, if I can stand to heat up the oven. This is one time when preparing most of the ingredients before you actually begin cooking is a good idea. Heat the olive oil with the bay leaves in a large Dutch oven over low heat. When fragrant, add the onions, garlic cloves, thyme sprigs, and sage leaves. Spread the carrots on top of the onions and do not stir. Season with salt and pepper; cover and cook about 5 or 10 minutes. Place the potatoes evenly on top of the carrots and onions. Add salt and pepper. Place the yellow (or green) beans, tomatoes, bell pepper pieces, and squash in layers, salting and peppering after each addition. If there are any juices left from cutting the tomatoes, drizzle them over the top. Without stirring, cover and cook until the vegetables are tender, about 45 minutes raising the heat to medium-low (the idea is to sweat these vegetables rather than saute or boil). If tightly covered the vegetables will produce plenty of flavorful juices. If the pot seems dry, add a few tablespoons of water or white wine. But add just a little because you'll be adding the liquid from cooking the shell beans. While the vegetables are cooking, simmer the shell beans in water to cover with 1 garlic clove and 1 thyme sprig and a little olive oil. When they are tender, season with salt and pepper. Add the beans, with any liquid to the pot. Chop the basil and garlic in a food processor with the oil and enough water to make a puree. Stir in the cheese, then taste and season with salt. Serve the vegetables in soup plates and spoon the Basil Puree over them. Shave Parmesan cheese over each serving, if desired. I've never added any wine to this soup so can't vouch for the flavor difference. It is perfectly tasty with only water. If you don't have fresh herbs, I am certain that you can use dried (except in the Basil Puree), although it won't be quite the same. Dried herbs have more oils so you should add less. I haven't tried it but imagine that a half teaspoon of rubbed sage and 3/4 teas of dried thyme would be a good point to start at. Taste it as it cooks and see if you need to add more. As for substituting dry beans for the fresh shell beans: I'm also sure this can be done but you will have to give yourself extra time to make sure the beans are cooked before adding to the soup. If you substitute a can of beans, I advise draining and rinsing the beans and adding a little extra water to the soup to make up for the loss of the bean cooking liquid. I don't know that I would use the canned liquid--it is often awfully salty. Although you might use half a can to get some more beany flavor. I think you could also substitute 1 1/2 cups frozen edamame beans, but they won't need to cook as long either. I also like to have plenty of potatoes and usually use more than what is called for (3/4 pound in the original recipe). And finally, you don't have to mess with peeling the tomatoes if you aren't bothered with tomato skin pieces in the final product. You can make sure you have basil year round, if you chop it up and mix it with some olive oil. Freeze in a zipper top bag in a thin layer. This way you can break off a hunk and use it when it is too cold to find fresh. Nothing says summer more than a BLT sandwich. Instead of a sandwich, try this chicken BLT salad. It's hearty enough to please all eaters, with a strong (but not overpowering) bacon and mayonnaise flavor. The recipe calls for Italian bread; I used our sweet sourdough and it was delicious. As written, the recipe makes a huge amount, so if you're serving 2 adults, I'd recommend halving it. Even then your servings will be generous. This salad is best fresh. Heat oven to 475F. Spread 1/4 c mayonnaise over both sides of bread, lay on baking sheet, and bake until golden brown, 8-10 minutes, flipping bread halfway through cooking. Let cool 5 minutes, then cut into 1-inch croutons. Meanwhile, cook bacon in 12-inch nonstick skillet over medium-high heat until crisp, 5-7 minutes. Using slotted spoon, transfer bacon to paper towel-lined plate and pour off all but 1 T fat left in skillet. Return fat to medium-high heat until just smoking. Pat chicken dry with paper towels and season with salt and pepper. Cook chicken, stirring often, until golden brown and cooked through, 2-4 minutes; transfer to plate. Whisk remaining 1/2 c mayonnaise and vinegar together in large bowl. Add bacon, cooked chicken, tomatoes, lettuce, and croutons and toss to combine. Season with salt and pepper to taste and serve. Almost everything I picked today was purple except for a handful of sungold cherry tomatoes and a lemon cucumber none of which made it to the basket. I'll admit I graze when I harvest. A wood-fired pizza place opened up in one of the suburbs of Brussels soon after we moved away from the area to Germany. We lived only two hours away and often made the trip back to Belgium. Sometimes we stopped at this little cafe. The thin crust pizza was great here but I found I also relished a dish of pasta, potatoes, and pesto. When I saw this recipe which includes green beans (which nearly overwhelm me each summer) I knew I had to add it to my repertoire. Toast pine nuts and garlic in 10-inch skillet over medium heat, stirring frequently, until pine nuts are golden and fragrant and garlic darkens slightly, 3 to 5 minutes. Let cool. In the same pot cook the green beans until they are tender and using the slotted spoon (or spider), transfer them to the baking sheet with the potatoes. Finally, add the pasta to the boiling water and cook, stirring often, until al dente. While pasta is cooking make the pesto: process basil, parmesan, oil, pine nuts, garlic, and ½ teaspoon salt in food processor until smooth, about 1 minute. Just before draining, reserve a couple of cups of the pasta water. Drain the pasta and return it to the pot. Add butter, lemon juice, pesto, 1¼ cups reserved cooking water, and ½ teaspoon pepper and stir vigorously with rubber spatula until sauce takes on creamy appearance. Stir in the potatoes and green beans. Add additional cooking water as needed to adjust consistency and season with salt and pepper to taste. Serve immediately passing more grated parmesan. I've made a fairly large range in the serving amount estimation. I usually find that servings for pasta recipes are quite large. Before you serve this for company, you may want to try it to find out how many servings it yields for your family. 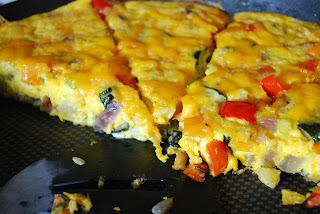 I love the variety of vegetables in this frittata, and the sweet flavor that comes from roasting. Both Michael and I agree that it's the best squash frittata we've tried. Note that I was out of Gruyere when I made this, so I used yellow sharp cheddar on the top. I'm sure Gruyere would be better. This recipe comes from my dear friend Michelle. We met in college and although we have rarely lived in the same place, we have had the excellent good fortune to see each other a couple of times a year, because we have family in places close to each other. Lucky me! Roast the vegetables. Preheat oven to 400F. Lightly coat two large baking sheets with cooking spray. Toss vegetables (zucchini through mushrooms) with enough olive oil to coat and season with salt and freshly ground black pepper. Arrange in an even layer on the prepared baking sheets. Roast 20-30 minutes, turning occasionally, until the vegetables are tender and caramelized. Set aside to cool. Preheat oven to 350F. Melt butter in a large 12-inch nonstick skillet over medium heat. Add the onions and garlic and saute for one minute. Add the roasted vegetables (should be about 3 c) and cook for one minute to heat through. In a large bowl, whisk the eggs, milk, 1 teas salt, 1/2 teas pepper, and Parmesan. Pour into the skillet with the vegetables and cook for 2 minutes over medium-low heat without stirring. Sprinkle half of the Gruyere over the top of the eggs. Transfer the pan to the preheated oven and bake for 20-25 minutes, until puffed and set in the center. Sprinkle with the remaining cheese and cook for several more minutes until the cheese has melted. Remove from the oven and set aside to cool slightly before serving. 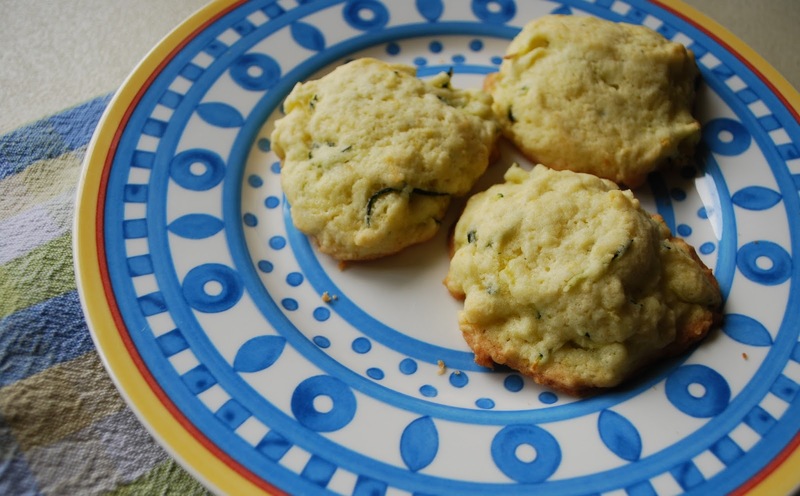 I have seen a number of recipes like this one, for savory zucchini pancakes and such. But my favorite is still this one from Vegetables Every Day. The crispy exterior is a delightful combination with the creamy interior. It's delicious as a side, or on its own for a light lunch. Shred the zucchini using the large holes on a box grater or a food processor. Wrap the shredded zucchini in several layers of paper towels and squeeze gently. Continue squeezing, using new towels if necessary, until the zucchini is dry. Place the zucchini in a large bowl. Add the garlic, salt, pepper, and egg and mix well. Stir in the flour. Heat 2 T of the oil in a medium nonstick skillet over medium heat. Fill a 1/4-cup measure with the zucchini batter. Turn the batter into the hot pan and use the back of the spoon to shape the batter into a 2-3 inch patty. Quickly repeat until the pan is full but not crowded. Saute until the fritters are nicely browned on the bottom, 4-5 minutes. Turn the fritters and continue to cook until they are nicely browned on the second side. Transfer the fritters to a platter lined with a paper towel to drain. Repeat with the remaining batter. The original recipe called for serving these with lemon wedges, but I almost never bother. In the months since we started this "blog" I have noticed more than previously just how much I love sweet/tart flavors. I'm sure this is why I have a penchant for Three Bean salads. This particular recipe is superior to most because it uses fresh snap beans rather than canned. Sometimes it can be hard to find yellow wax beans but look for them in a farmer's market. If you are unable to purchase them, make this salad with a full pound of green beans; it will taste just as good. Bring the vinegar, sugar, oil, onions, garlic, salt and pepper to boil in a small saucepan over medium heat. Reduce heat to low and simmer until sugar dissolves and onions have begun to soften. Cool. Dressing can be made ahead and stored in an airtight container for 3 days. Fill a large bowl with ice water. Bring 4 quarts water to boil in a large saucepan over high heat. Add 1 T salt, both types of snap beans and cook until just tender. Drain beans in a colander and immediately transfer to the ice water to cool. Drain again and let dry a bit on paper towels. Beans can be refrigerated for 24 hours. Combine snap beans, kidney beans, dressing and parsley in large bowl and toss to coat. Cover and refrigerate until chilled, about 30 minutes. Check seasoning and add salt and pepper if needed. Serve. Salad can be refrigerated in an airtight container for 2-3 days. I so enjoyed smoking ribs a few weeks ago that I have wanted to try my hand at other barbeque recipes. So yesterday I tried this out. I am mostly happy with the results. My butcher shop trims their meats so well that my brisket didn't have the fat cap that is called for. Mine may not be as moist as it would have been with more fat. It did have a wonderful smoky flavor that I have rarely enjoyed even in a barbecue joint that wood-smokes their offerings. This recipe starts on the grill and finishes in the oven so the cooking temperature can be controlled as the brisket finishes. Combine the ingredients of the rub in a small bowl. With a sharp knife, cut a 1/2-inch crosshatch pattern through the brisket fat cap about 1/4 inch deep. Rub the brisket with the spice mixture. Wrap it in plastic wrap and return it to the refrigerator for at least 6 hours or up to 24 (the longer the better). Just before grilling soak the wood chips in water for 15 minutes, then drain. Using a large piece of heavy-duty foil, make a packet for the drained wood chips and cut several inch-long vent holes in the top. Remove the brisket from the refrigerator and pat it dry. It is not necessary to remove the rub. Transfer the brisket to the disposable pan. Open the bottom vents halfway. Light a large chimney starter filled with charcoal briquettes (6 quarts or totally full). When the top coals are partially covered with gray ashes, pour the charcoal on one side of the grate and set the foil packet on the coals. Cover the grill with vent holes open halfway and let heat for 5 minutes until the wood chips are smoking. Put the cooking grate in place and set the pan with the brisket on the side where there are no coals. Cover grill with the vent holes over the brisket, and cook for 2 hours. Place the wood chip packet over the primary burner. Cover and heat the grill for 15 minutes, all burners on high. The wood chips should be smoking. Turn off all but the primary burner and place the brisket in the pan over the cooler parts of the grill. Cook for 2 hours. In the meantime mix the sauce and set aside. Preheat your oven to 300F so it will be ready when grill-cooking is done. Pour the sauce mixture over the brisket. Cover the pan tightly with foil and transfer to the oven. Cook until the brisket registers 195F, 2 to 3 hours. Turn off the heat and let the brisket rest in the oven for 1 hour. You may serve at this point or let it cool and set in the refrigerator for an additional rest of up to 24 hours. After the hour rest, remove the sauce from the aluminum pan and place in a saucepan. Skim some of the fat off the surface. Set the sauce on a burner at medium high heat and bring to a boil. Allow it to cook rapidly, stirring frequently, until the sauce has thickened to your preference. Slice the brisket in 1/4 inch slices against the grain. Serve with sauce. The following recipe is one of the reasons that summer time is worse than Christmas time for me as far as the scale is concerned. We grow both strawberries and raspberries and often have an abundance. I find this recipe a bit fussier than many from Cook's Illustrated (I think it must be the removal of the berry seeds) but it is worth it to me. This is one of my three favorite summer desserts, all of which feature berries. Almost any fruit may be made into a fool and apparently gooseberry fool is a favorite in Great Britain where this dessert originated. You'll need a total of 2 quarts strawberries and 1 pint raspberries. You can substitute blueberries and blackberries for the raspberries. You can also use frozen fruit but the texture will be different. If you do use frozen fruit, reduce the amount of sugar in the puree by 1 T. I would avoid strawberries that are frozen with sugar which would cause a sugar overdose. Wash and hull the strawberries and rinse the raspberries. Place them in a food processor (or good blender) with the sugar and process until the mixture is completely smooth, about 1-2 minutes. Strain the berry puree through a fine mesh strainer into a large measuring cup. You should have 2 1/2 cups puree; reserve any excess for another use. Transfer 1/2 c puree into a small bowl and sprinkle the gelatin over the top; stir until the gelatin is incorporated and let stand at least 5 minutes. Heat the remaining 2 c puree in a small saucepan over medium heat until it begins to bubble in the middle. Remove the pan from the heat and stir in the gelatin mixture until dissolved. Let cool and transfer to a refrigerator storage container and refrigerate until cold, about 2 hours or up to 4 hours. Chop the strawberries into rough 1/4-in. pieces. Toss the strawberries, raspberries, and the sugar together in a medium bowl. Set aside to macerate for 1 hour. Drain through a strainer just before serving. Place cream, sour cream, vanilla, and 4 T sugar in a chilled bowl. Beat on low speed until bubbles form. Increase the speed to medium and continue beating until beaters leave a trail. Increase the speed to high and continue beating until the mixture has nearly doubled in volume and holds stiff peaks. Transfer roughly 1/2 c whipped cream mixture to a small bowl and set aside. Remove the thickened berry puree from the refrigerator and stir to loosen. Add 2/3 of the puree to the cream mixture and mix until incorporated with the mixer or by hand. Using a spatula, gently fold in the remaining puree, leaving streaks. Place a spoonful of drained berries in 6 tall parfait or sundae glasses. Top with a spoonful of the fool mixture. Repeat the layers and finish with a layer of berries on top. Finish with a tablespoon of the whipped-cream mixture on top. One last thing: top the whole thing with some cracker crumbs. We find McVities digestive biscuits best for this but they may be hard to locate. The best place may be a foreign market or the internet. This is my version of this recipe and it differs some from the Cook's Illustrated original recipe. I have doubled the amount of cream and sour cream because I like it better with less puree. If you want to try the original recipe, use 1 c heavy cream, 1/4 c sour cream, 2 T sugar and 1/2 teas vanilla. Because I use less of the puree, I'm sure I use more fruit. Because there are only two of us here, I make the puree and keep it in the fridge for up to 5 days. I don't really measure how much I use to make two servings. I whip some cream with a dollop of sour cream and some sugar and mix in some puree until I like the looks of it and layer it up with macerated fruit. Even though it probably isn't exactly the same each time I serve it, it always tastes great. Cook's Illustrated recommends using Carr's Whole Wheat Crackers for the cracker topping. I haven't been able to find them so I can't say if they are as good as digestive biscuits which are much better than graham crackers. But use graham crackers if you can't find biscuits. Or skip them altogether. Tomatoes are on! My little guys enjoy eating sweet cherry tomatoes right off the plant. I don't blame them--it is such a treat, to eat a mouthful of tomato warm from the sun. Here's one of my favorite ways to prepare them, when we have enough to cook. It's from my favorite cookbook, Vegetables Every Day, which is used so well that the binding is broken and I've got pages falling out. Heat the oil in a large skillet. Add the onion and saute over medium heat until golden, about 5 minutes. Raise the heat to medium-high and add the tomatoes. Cook just until the tomatoes are heated through and the skins are beginning to brown in spots, about 2 minutes. Add the olives, parsley, and pepper to taste. Transfer the tomato mixture to a wide, shallow serving bowl. Sprinkle the cheese over the tomatoes and serve immediately. I love the sweet/tart flavor of rhubarb preparations but most of the time they are desserts. This is a way to use this vegetable as a vegetable. It is slightly sweetened as a counterpoint to the salty ham but it's nice to eat rhubarb in a savory form. This is a quick meal and if you are lucky you might still find some rhubarb in the supermarket or at a farmer's market. If not, you can use frozen rhubarb any time of the year, just salt it for 30 minutes or so. See if you can find a butcher to cut you a bone-in ham steak that is cut crosswise from a whole ham. These steaks are superior to individual (and sometimes processed) ham steaks. This sauce would work fine on slices from a previously cooked ham, as well. Toss rhubarb with 1 teas salt in medium bowl and let sit for 20 minutes. Rinse rhubarb in colander and drain well. Set aside. Heat butter in large skillet over medium-high heat until foaming subsides. Add ham steak and cook without moving until browned, about 5 minutes. Flip steak and cook on second side until browned, about 4 minutes. Transfer ham steak to serving platter, tent with foil, and set aside. Return skillet to medium heat and add water, vinegar, sugar, and ginger. Simmer until sugar has dissolved, about 30 seconds. Stir in rhubarb and cook until tender but not mushy, 5 to 8 minutes. Season with salt and pepper to taste. Spoon sauce over ham steak and serve. This recipe wins the award for the most original zucchini use! These cookies have a nice crunch on the outside, with a light and cakey crumb on the inside. I have stored them in the cookie jar, and unfortunately they have lost their crunch; maybe another storage option would work better. It might be fun to try it with different citrus, too--zucchini orange cookies, zucchini lime cookies? Maybe. On altitude: this is the original recipe, no adjustments made for high-altitude. I'll try to adjust and post the changes. But these cookies are so good, I couldn't wait to share. Preheat oven to 375F. Combine flour, baking powder and salt in a separate bowl. In a mixer, combine butter and sugar; beat until light and fluffy. Add the egg and mix until incorporated. Add lemon zest and zucchini and mix until fully combined. With the mixer on low, slowly add the flour mixture to the wet ingredients until all the flour has been added and is completely mixed in. Do not overbeat. Drop by rounded teaspoon onto a prepared cookie sheet and bake for 14-16 minutes, or until edges of cookie are golden. Make a simple glaze mixing powdered sugar and lemon juice depending on your preference (about 3 parts sugar to 1 part lemon juice is what I used). You can pipe the glaze on if it is thick (use a baggie with a corner clipped off) or brush it on if it is thin. A fun result of posting here and elsewhere about my zucchini surplus is that friends are sharing their best zucchini recipes with me. This one comes from my cousin, Katie Peterson. The burgers are flavorful and moist--they taste like summer. The original recipe came from the cookbook Jerusalem, which must be making the rounds in the food world, as I've seen it mentioned a couple of other places. In a large bowl place the grated zucchini, sliced green onions, chopped mint, cilantro, garlic, ground cumin, salt, pepper, and cayenne. Stir to combine. With your hands, mix in the ground turkey until the zucchini mixture is well distributed through the ground turkey. Use your hands to form 3-4 inch wide patties, placing them on a baking sheet. Note that the patties will be rather wet, so they may be a little tricky to handle. Heat 3 T vegetable oil in a large frying pan on medium high heat. Once the oil is hot, lower the heat to medium. Working in batches, place the patties in the pan. Let cook for about 5 minutes, then flip the patties over and cook for another 5-6 minutes. You want them to brown and to gently cook all the way through. If the temperature is too high, they'll get browned on the outside but the inside will still be raw. So, cook them gently. If the outsides are browned and the insides still aren't done, lower the heat and cook longer. Once the first batch of patties are done, remove to a paper towel-lined plate while you cook the second batch. Or you can keep the patties warm in a 200F oven. Serve with sour cream sauce and enjoy!